1. The PBR Velocity Tour Finals are happening Nov. 2 -3 at the South Point. Watch some of the best bull riders in the world compete. The PBR World Finals kick off Nov. 7 at T-Mobile Arena. 2. The 9th annual Holiday Craft and Gift Festival is taking place Nov. 2-4 at the Orleans Arena. Christmas decorations, clothing, ceramics, candles, photography, specialty foods and more for sale. Christmas trains on display. 3. The 18th annual Life in Death Festival is happening Nov. 1-2 at Winchester Cultural Center. Traditional food, craft vendors, beautiful ofrendas, live entertainment and more. 4. The Day of the Dead Main Street Walking Parade starts at 6:30 p.m. Nov. 2. Cash prizes for best costumes, face painting, free beer, tequila tastings, beautiful alters, live music and more. 5. Texas Station's Friday night bowling package includes 10 street tacos, shoe rentals, a pitcher of beer and soda and 2 hours of play (10 p.m.-1 a.m.) for up to 5 people for just $55. Pr, enjoy two hours of bowling, a large pizza and pitcher of soda or beer for 5 people for $70 from 4-6:30p.m. Saturdays. 6. The Great Las Vegas Taco Festival is happening Nov. 2-4 at Craig Ranch Regional Park. Amazing taco creations, live entertainment, folkloric dancers, a Selena musical tribute, margarita bar, Micheladas and more. 7. Sesame Street Live! is bring "C is for Celebration" to Henderson Pavilion on Nov. 3. Watch Elmo, Abby, Cookie Monster, Grover and Rosita in a performance full of laughter, music, and excitement! Two shows. 8. The 3rd annual Pray for Snow (at Lee Canyon) party will take place 3 to 7 p.m. Nov. 3 at Skye Canyon Park. Food, beverages, craft beer, live music, a vendor village and prizes. The event will also kick off a winter coat and jacket drive. 9. The 11th annual Vegas Valley Comic Book Festival is happening Nov. 3 at Clark County Library on Flamingo Road. Artist Alley, live music, live podcast recordings, meet-and-greets, special gues panels and more. 10. Sunset Park'd on Nov. 3 at Sunset Park will feature many food trucks and microbrews. There will also be a Vegan Village with multiple participants. Live entertainment on two stages and a carnival for the kids. 11. The Escape City Tour featuring electronic music heavy hitters Gorgon City and special guest King Henry take over the Downtown Las Vegas Event Center on Nov. 23. 12. Lee's 16th annual Wine Experience is happening Nov. 3 at Thomas & Mack Center. More than 1,000 wines from around the world. 13. The 25th annual Holiday Cactus Garden Lighting at Ethel M Chocolates is happening Nov. 6. Performances by Las Vegas Philharmonic, The Sound Collage and Matt Goss. Special appearance by Penn & Teller. 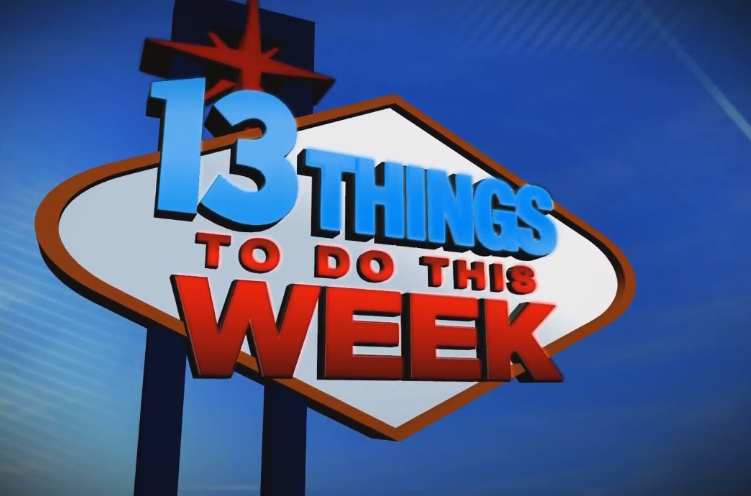 If you would like to submit an item for a future 13 Things, send a press release to joyce.lupiani@ktnv.com.